This is far from a conclusive list of New Zealand hostels, but having hit six cities in just over a week I’ve had a chance to stay in a few hostels and get an idea of them along the way. If you’re headed to any of the cities listed below and want a recommendation, I’d go so far as to say that every hostel we stayed in was perfectly acceptable and I’d recommend them to others. That said, there are pros and cons to be weighed up. After all – your sleep depends upon it! 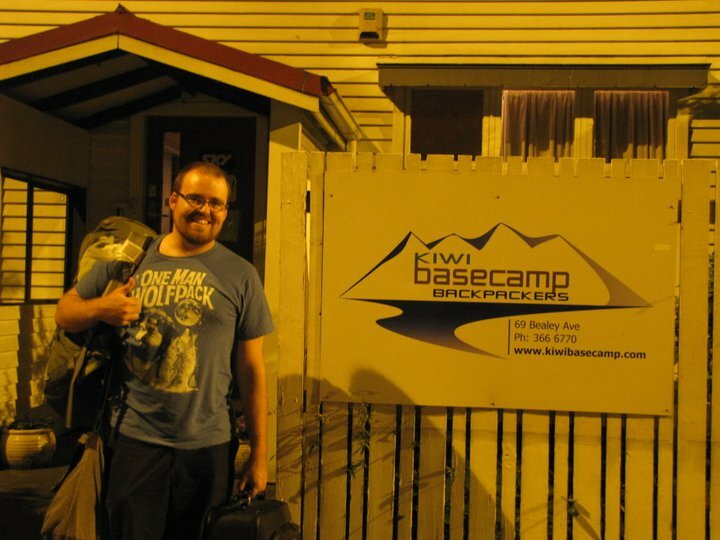 Our first stop in New Zealand was the well placed Kiwi Basecamp, although it had only become our venue of choice after our first choice was damaged during the Christchurch earthquake earlier in the year. Placed not too far from Cathedral Square (about a fifteen minute walk), the hostel certainly had accessibility in its favor. The bedrooms are modest and sport two sets of bunks and there are kitchens on both floors of the two story building. Kitchen space is at a bit of a premium, but points for the stylish (if not impractical) stools that are available to perch on as you eat. There is also an entertainment area in an unattached building behind the main one – a TV with Sky TV (cable) and a modest DVD library is on site. There are plenty of comfortable arm-chairs and couches to lounge around on too. Lock boxes are located underneath the beds for your valuables. Other features that we didn’t take advantage of include a free airport shuttle between 8am and 8pm, free bike hire, a daily shuttle to the supermarket, and a free continental breakfast. There’s also wireless available (for a price) and plenty of bathrooms and toilets so you’re not going to be fighting to take a slash. It’s nothing fancy but it will get you through a few nights relatively peacefully. The staff are friendly and (according to advertisements) multilingual as well. Cost – Ranges from $23 for a bunk in a dorm to $45 for a single room. While I’d go as far as saying that Deco Backpackers was my least favourite of the New Zealand hostels we visited – it’s not necessarily a bad thing. It’s well located just above the main street of Queenstown (although getting home does involve a rather unpleasant climb up a steep hill), has free wireless in its dining area, and featured a far better equipped kitchen than the one I’d encountered in Christchurch. The dorm rooms are slightly larger than what we found in Christchurch, and while there is no lockers in your room, there’s free storage facilities on site. The free wireless access in the spacious dining hall is a real perk and if you’re lucky enough to be in a room close to reception you’ll get free access in there as well. There’s a large set of bathrooms in the back and a modest garden area for late night beers and card games. Linen is going to cost you an extra $1 a night, but that’s not much in the grand scheme of things – especially given how cheap things are. It’s close to Queenstown’s bars as well. I hadn’t expected a great deal from the grandly named Château, but it ended up being my hands down favorite place of the New Zealand hostels we stayed in. The entire dorm building gives off the vibe of a medieval tavern with its wood paneling, black and white photographs, rusty kitsch on the walls, and open living areas. After a few nights of feeling isolated in a crowd – the Chateau made us feel like we were part of a group rather than a pair of individuals. The rooms are not only spacious but feature surprisingly comfortable beds, and there are heaters in every room to combat the persistent cold in the region. There is a large kitchen with separate dining and entertaining areas – and free vegetable soup is served up at 6pm every night. There are also discounts available for the nearby Monsoon Bar – which has a very good selection of food. There’s a hot tub on site that we never did get the pleasure of taking a dip in, wireless for purchase, and board games are available for rent at the front desk. The staff are friendly and the place is (like all places in Franz Josef) nice and close to the main drag. There’s also free popcorn available if you want to watch a movie on their flat screen TV. Cost: See website. Damned if I could find one. We spent barely more than 12 hours in Nelson, but the city and the Paradiso did enough in that short time to make an impression. Paradiso’s first real drawback is that it lies a good 10-15 minutes walk from the city centre. They’ve also got limited wireless internet access that only operates during office hours, which I found a tad limiting when you’ve got people coming and going at all hours. The positives are a bit more numerous. The backpackers has a decent sized pool with the requisite BBQ and deckchairs, and there’s also an antiquated bus (affectionately named Bessie) that has been converted into a late night bar and party spot so that the neighbours don’t have to contend with drunken revelry at all hours. The staff we encountered were courteous and friendly (a first up to this point in our NZ trip), and there’s a free packet of ramen (two minutes noodles) with check in – a big plus for those on a tight budget. The hostel itself is a converted building with small but comfortable rooms and a large semi outdoor cooking area. As I said, we weren’t in Nelson long and we were in our hostel even less – but Paradiso looked like the kind of place I’d have enjoyed spending a few days in under different circumstances. Cost: Range from $17 for a tent spot or $20 for a spot in a dorm to $99 for a luxury single room. Our first brush with the flashpacker phenomenon afforded us some much needed privacy. After sharing rooms from the 17th until the 24th, it was a rare pleasure to check into a room that was all our own. Suffice to say our belongings were strewn all over the place within fifteen minutes of arriving. There’s something to be said for the comfort of your own mess. Attached to the more upmarket Regent Rotorua, the Flashpackers enjoys the same kind of service you’d expect from a top line motel. The staff at the Regent proper were not above helping out us poor backpackers, and Emma at reception was helpful beyond belief in arranging tours and transfers. The ‘private room’ we’d booked was no different than a regular dorm in that it had a queen sized bed and three bunks in it, but true to their word we were not sharing with any smelly Germans or drunken Aussies. To be honest the rooms were a tad small and basic, but the rest of the place made up for that. There’s a basic kitchen and living area on site as well as a few spots to log on to the internet and check your mail. The bathroom facilities are spacious and kept clean by Emma and her family, and there’s even two on site mineral baths that can be used on request. We never did find the time though. A big perk of the Flashpackers is that it is a short two minute walk from Rotorua’s ‘Eat Streat’ – where you can find everything from greasy fish and chip shops to classy cafes and eateries. It’s also a short walk from the lakeside park where markets are held every second Sunday, and within 10 minutes walk of the iSite where buses do their pick-ups. The last of our stops in New Zealand was the absolutely gorgeous Verendahs. We hadn’t stayed in any place I’d have called a dump, but Verendahs was set up in a cute converted house and every room had plenty of its own charm. The sitting rooms were more akin to what I’d expect to find in my grandmother’s than in a backpacker, although the absence of televisions was a shock after their prevalence in other hostels. Internet terminals and ancient CD players were the only sign of technology in these quiet rooms. A short taxi ride from downtown and right by Ponsoby Road (where there are plenty of cafes to browse) – the staff here were friendly and helpful, and it was the only place we stayed in which bunks were not the norm in a dorm setup. In fact, this is one of their chief selling points on their website. Fallon and I didn’t do a lot of exploring of the site itself, but there’s ample laundry and bathroom space to be had (the best showers we found in New Zealand by far) and you’re close enough to the city that you can have food delivered if you’re feeling lazy. I know we did.